Nashville, TN—Today, activist shareholders and customers called for product safety and hazardous chemical policies at Dollar General’s annual shareholder meeting. Concerned about hazardous chemicals found in products and food purchased from the discount retail chain’s stores—including per/polyfluoroalkyl substances (PFAS) in microwave popcorn, bisphenol-A (BPA) in canned food, and heavy metals and phthalates in consumer products—stock-holding parents and health experts asked executive leadership to adopt hazardous chemical policies and share them with the public, as other retailers have already done. As Dollar General executives entered the shareholder meeting, these concerned parents and Dollar General shoppers expressed desire for safer products and dissatisfaction at the brand’s lack of public product safety policies. 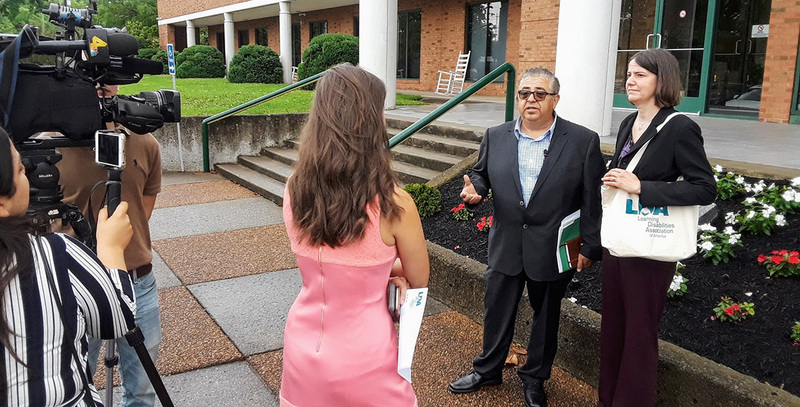 Jose Bravo, Coordinator of the Campaign for Healthier Solutions, asked Dollar General's CEO, Todd Vasos, if he would meet with the campaign to discuss these issues. Mr. Vasos agreed to meet with campaign representatives, but has not yet committed to any further efforts to reduce chemical hazards in the company's products and food. A video-stream of the shareholder meeting was also made available to the public. The Campaign for Healthier Solutions, a coalition of public health, environmental justice and economic justice groups purchased shares in order to attend the Dollar General's shareholder meeting and seek commitments to reduce customer's exposure to toxic chemicals, especially in communities which already face disproportionate exposure to hazardous chemicals and pollution. Working with a broad range of advocates interested in public health and sustainable business, the campaign presented letters urging Dollar General to act on toxics from chapters of the Learning Disabilities Association of America, the American Sustainable Business Council, and over 60 environmental, justice, and public health nonprofit advocacy groups. The campaign is focusing on reducing chemical exposures from dollar store products and foods because dollar stores are a substantial and growing retail segment, and because they lag far behind other retailers at establishing proactive hazardous chemical policies. Further, many rural communities or low-income families have limited access to other retail outlets, creating concern that some families have no choice but to bring products into their homes which have fewer assurances of toxic chemical safety. Jose Bravo, Coordinator of the Campaign for Healthier Solutions said, "Today, Dollar General executives failed to take action to address the serious concern many customers have about their product safety. This missed opportunity—to announce open and transparent chemical safety policies—was a chance to restore confidence in their brand and the safety of their products. Dollar General is now one of the last major national retailers which still hasn’t acted to address toxic chemicals, publicly commit to sourcing products made from safer alternatives, or even issue a corporate sustainability report. Until Dollar General acts, customers who live in food deserts or who have no option but to shop at stores selling cheap products made with toxic chemicals—will continue to wonder if their constrained choices are harming their children’s health. We’re still hoping Dollar General will take steps to make this situation better, but until they announce publicly accountable toxic chemical policies, they will continue falling further behind other stores and increasingly risk becoming a liability to their shareholders." Other retailers, including Target, Walmart, Amazon, Costco, and even Dollar Tree have taken action to protect customers and limit toxic chemical exposure from their products, but at this point Dollar General has failed to follow suit. Dollar Tree recently asked suppliers to phase out 17 highly hazardous chemicals from its supply chain and products. Dollar General currently has no significant public commitments to address hazardous chemicals in their supply chain or products. Campaign members noted that this inaction leaves Dollar General drifting further behind competitors regarding consumer expectations of product safety, and adds to widespread public sentiment that dollar store products may be more dangerous than products purchased at other major retailers. Tracy Gregoire, an advocate with the Learning Disabilities Association (LDA) of America, said, "Developmental disabilities have reached epidemic proportions—now affecting 1 in 6 children. About a quarter of these disabilities are linked to toxic chemical exposures. Phthalates, a chemical class added to plastics and found in children's products purchased at Dollar General, are linked to lower IQ and behavior challenges. Prenatal and early childhood exposure to hazardous substances like these can lead to life-long impacts and chronic health conditions. Dollar General has both the opportunity and the responsibility to become an industry leader by advancing strong and transparent safer chemical policies." Product testing of items purchased at Dollar General locations revealed that many contained toxic chemicals at levels which may pose a threat to customers and their families. This independent laboratory testing found numerous products containing phthalates, polyvinyl chloride, chromium, antimony, and other hazardous chemicals at levels above safety guidelines established by other retail chains or governing bodies. Further, recent testing found Bisphenol-A (BPA) in the liners of canned food purchased at Dollar General, which is known to leech into food. BPA is an endocrine-disrupting chemical contributing to breast and prostate cancer, type-2 diabetes, obesity, asthma, and other health problems. Recent testing of microwave popcorn purchased from Dollar General also found that bags were laced with per/polyfluoroalkyl substances, which disrupt the body’s endocrine system and have been linked to a wide range of health problems. Community advocates asserted that it is especially important for dollar stores (including Dollar General) to exceed mere compliance with federal law, as other retailers have, because dollar stores are often located in communities already face higher rates of toxic chemical exposure and overlapping pathways including pollution, workplace exposures, and other sources. The Campaign for Healthier Solutions isn't calling for a boycott of Dollar General, but instead organized today's action to encourage the chain to follow the leadership of other retailers by identifying and removing harmful chemicals from their products, and making those efforts public. The campaign seeks to work with discount retailers to help them protect their customers and the communities in which they operate.